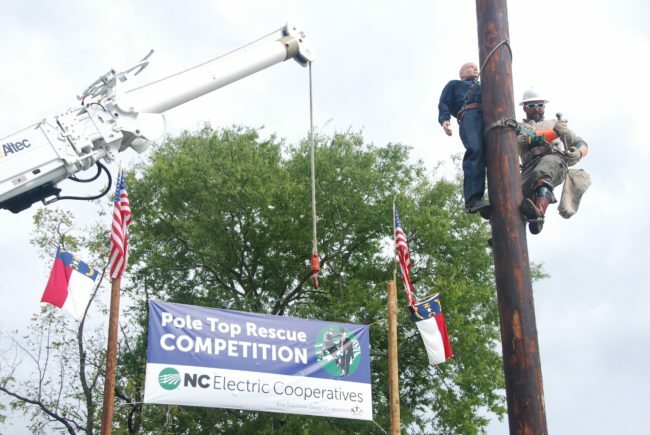 The Statewide Pole Top Rescue Competition has been rescheduled to take place Thursday, May 30, at the Raleigh office of North Carolina’s Electric Cooperatives. The competition had been scheduled for September 2018, but was delayed due to restoration efforts following Hurricane Florence. During the competition, which will be the 16th biennial event, electric co-op linemen from across the state will converge in Raleigh to test their skills. Dressed in full climbing gear, they must perform in a scenario that finds a fellow worker unconscious atop a utility pole. The line worker must radio for help, climb 20 feet up a utility pole, rig a rope, lower a 105-pound mannequin and begin CPR. Pee Dee Electric’s Kenny Simmons scored the fastest time in the 2016 competition. Previous winners have completed all the steps in this scenario in less than two minutes. Competitors at the statewide event represent those with the best time with fewest errors from local competitions held at their electric co-ops.